I remember the first time I heard a Neil Young song. I was 17 and I had recently moved out of my parent’s house to attend university in Ottawa. A friend and co-worker with whom I worked at Tim Hortons in my home town sent me a song through MSN Messenger. That song was a live version of “Sugar Mountain” (I think it was from Live Rust). I liked the song and for years kept it on my computer, listening to it from time to time. There was something mystifying about it. I really responded to the melancholic tone of the song. It took me several years to dig up more songs by Young and begin my exploration of his discography. I remember discovering that he was the writer of “Heart of Gold”, a song I first heard on a Boney M CD my mom had. It took me a few years to listen to about half of Young’s prodigious output. It’s time consuming because he has so many albums and some of them are so damn good they kept me busy for weeks on end. Naturally, I listened to other music while working my way through his back catalogue and because of this it took me years to get relatively knowledgeable about the man and his music. Throughout those years my respect and admiration for Young has steadily increase. 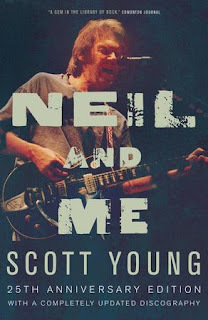 So much so that when I found a battered copy of Neil and Me: The Neil Young Story by Scott Young, I picked it up without hesitation. Neil and Me is written by Neil’s father, a writer. He was a minor celebrity on Canadian television due to hosting Hockey Night in Canada in the late 50s. Being the writer of his son’s biography gave the book a very interesting perspective. Some parts of the book are actually as much about Scott as they are about Neil. I didn’t mind because it often related to Neil in some way and it gave the book a broader perspective than it otherwise might have had if it had been written by someone outside of Neil’s family. What I mean by broader perspective is that events are recounted from an insider view, thus giving certain events an intimate coverage, looking at how the events affected people other than just Neil. A good example is how Neil’s step sister, Astrid Young, once worked with his tour crew. Scott tells us how this related to Neil but also how it related to Astrid. Since both are children of his, Scott is equally interested in recounting the impact of this story on both Neil and Astrid. The writing style makes both perspective seem equally important and, honestly, I actually enjoyed a fair deal of the non-Neil related asides. It helped that they often circled back to Neil in ways that explained his character or his temperament at the time. 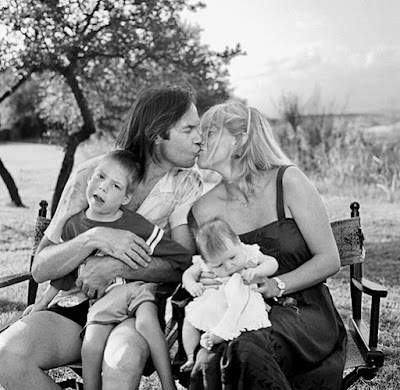 This odd yet very engaging balancing act between the rock star life of Neil Young and the more intimate story of the extended Young family greatly contributed to giving this book its unique flavour. The book chronicles Neil’s life from the years leading up to his birth and up to 1986, the year of the revised publication of Neil and Me. Part of this unique flavour is that the book focuses less on the music and more on Neil and his life, particularly his family life. Events in Neil’s life are interpreted and presented through Scott’s paternal filter. Through this we get to learn a lot about Neil's personality. He's rough around the edges, but very capable. Scott Young (left) with his song Neil. Scott managed to convey the more personal and human aspects of Neil without reducing the more public aspect of his life. While reading, I was a little surprised to learn how much of a big deal Neil Young really is. Not just to me, but to the history of rock ‘n’ roll. He's easily comparable to some of the biggest names in rock from the sixties and seventies. One of the differences between him and those other artists is that Neil has remained active, putting out albums regularly, since his debut album with Buffalo Springfield in the 60s. He’s a very important figure to the history of rock music and I wasn’t expecting. 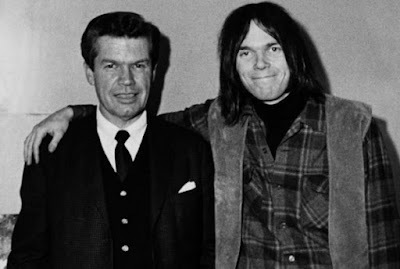 People always talk about Bob Dylan but damn, Neil Young deserves more praise than I think he gets. One of the things I found interesting about this book was the transition Neil had as a person and as a musician from the beginning of his career in the sixties all the way through to the mid-eighties. As a young man his focus was solely on his music. Everything else in his life was secondary. It also seems that with each additional project, be it a solo or group project, Neil strived to challenge himself and do something different. His reaction to the success of After the Gold Rush and Harvest was to knowingly steer his next projects away from path that led him to that success. This led to the famous Ditch Trilogy of albums. His motivation to try different things, to move from one musical genre to the next, was an attempt to avoid creative stagnation. That he managed to do this amidst personal struggles and while absorbing a crucial aspect of life during the seventies is nothing short of spectacular. His prodigious output during the late sixties and seventies was not only one of quantity but of impressive quality. His first dozen or so albums have stood the test of time and many of them are classic examples of rock ‘n’ roll, folk, and country rock. During the eighties, after the birth of his son Ben to wife Pegi, Young’s focus shifted towards family life. Having been born with cerebral palsy, Ben required the attention of both his parents. Neil and Pegi, aided by friends and acquaintances, spent twelve hours a day helping their son's physical and mental development. They tried their hardest to help Ben meet his full potential. There is an interesting shift that happens to Neil at this point in his life. Not a change in personality, but a readjustment in priorities. He still made music, he still went on day trips, worked on his train set, work on his film projects, but he did these things after taking care of his son or on his afternoons “off” (afternoons where others were helping out Ben). Neil with wife Pegi, son Ben, and daughter Amber. Shortly after this point in Neil’s life the book ends. It feels like an abrupt end and that’s because it is. Neil and Me kind of just stops rather than finishes. It’s mid-career for Neil, but this book was first published in 1984 and the revised version was published two years later. At the time of publication it covered Neil’s entire life up to that point. It was a very enjoyable biography. It's well written. Scott Young has been a writer all his life, both journalism and fiction. His writing style is casual, inviting, yet very informative. He doesn't just relay the facts; he considers what those facts can teach us about Neil's life and his personality. His unique perspective was also interesting. It's not a third party writing about a critically successful and incredibly popular rock ‘n’ roll icon. It's a man writing about another man who happens to be his son and, oh yeah, he's led a very successful career as a musician. He humanizes Neil with ease without undermining the success he's had and his hard work along the way. It's also pretty clear that he and Neil have lived separate lives while also keeping a regular contact, albeit sometimes with months of silence in between reunions. Man, narrowing down the list to 5 albums was tough. It almost took more time to come up with a top five than it did to write the rest of this article. You’ll note these are all early albums. That’s because I’m not as familiar with the second half of Young’s career. Sound off in the comments with your top five albums!